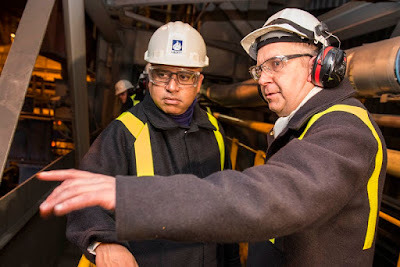 GFG Alliance, the international grouping of businesses founded by the British Gupta Family which includes Liberty Speciality Steel in Rotherham, has announced plans to create a total of five million tonnes of low-carbon steelmaking capacity over the next five years. The company said that its overall plan, which would see it create capacity that equates to half of all the steel made in Britain at present, would play an important role in delivering the vision for "clean growth" outlined in the UK Government's Industrial Strategy. Liberty is pioneering a GREENSTEEL strategy to establish a major integrated, competitive and low-carbon steel and engineering enterprise across the UK. A key component of this plan is the recycling of scrap steel in arc furnaces powered by renewable energy. It aims to recycle at home a large proportion of the 7.2m tonnes a year of scrap steel currently exported from the UK each year. This low-carbon secondary steel production would displace much of the 6.6m tonnes of raw steel currently imported into Britain each year. At present the UK exports more of its scrap for processing abroad than any other developed economy and GFG says this abundant raw material – 10m tonnes a year rising to 20m within a decade – provides the country with a huge opportunity to drive clean growth by making low-carbon steel at home. Liberty is already a leading producer of recycled steel, with melting capacity of 1.1m tonnes per year in the UK. October saw the official re-activation the "small bloom" caster at Aldwarke more than 18 months after it was mothballed by previous owners during the steel crisis. The revamped caster provides more high-grade steel bar for automotive and engineering components in the UK and beyond and the bar mill at Rotherham has doubled the number of shifts in order to boost output from 78,000 tonnes to 137,000 tonnes a year. The company is aiming to re-ignite Rotherham's second electric arc furnace early in the New Year, restoring the site's position as one of the UK's leading producers of recycled steel. Jay Hambro, chief investment officer of the GFG Alliance, said: "The Government's White Paper acknowledges clearly that green energy and industrial competitiveness go hand in hand and we welcome the document's emphasis on clean growth. That link between energy and industry has been at the heart of our own GREENSTEEL strategy and we are greatly encouraged to see public policy going strongly in this direction. "GREENSTEEL, made using renewable energy, has only one tenth of the carbon footprint of blast furnace production and should form a key part of the clean growth focus. "We share the Government's vision for a rejuvenated manufacturing base that is sustainable both economically and environmentally. In the years ahead, UK industry will be both green and competitive to support increases in productivity."